Staff photo by CHRIS GAROFOLO Drivers are being cautioned to avoid the downtown on Sunday as hundred of runners will be taking part in the Gate City Marathon. NASHUA – Close to 900 runners are expected to take part in Sunday’s Gate City Marathon, said Jennifer Jordan, the marathon’s director. “That 200 more than last year,” Jordan said. The event includes a marathon, a half marathon and a relay for runners throughout New England. This is the third year the race will take place, Jordan said. The event was started because there are no marathons in the area, she said. “There isn’t one, locally, in the spring,” she said. The Gate City Marathon organization is a nonprofit that assist schools through scholarships and it works with young runners through Nashua Police Athletic League (PAL). “We’re trying to do what we can to reach out to the community,” she said. Runners can use their times at the Gate City Marathon to qualify for Boston Marathon, she said, noting every runner will have different qualification requirements depending on the age and gender division they compete in. A marathon of 26.2 miles can take anywhere between three and five hours to complete, she said, depending on the runner. The Gate City Marathon includes running loops throughout the city, including two blocks on Main Street. That two block section will be closed to vehicle traffic for the marathon, she said. The starting line and finishing area is on Main Street, between the intersections with E. Hollis Street and Eldridge Street. 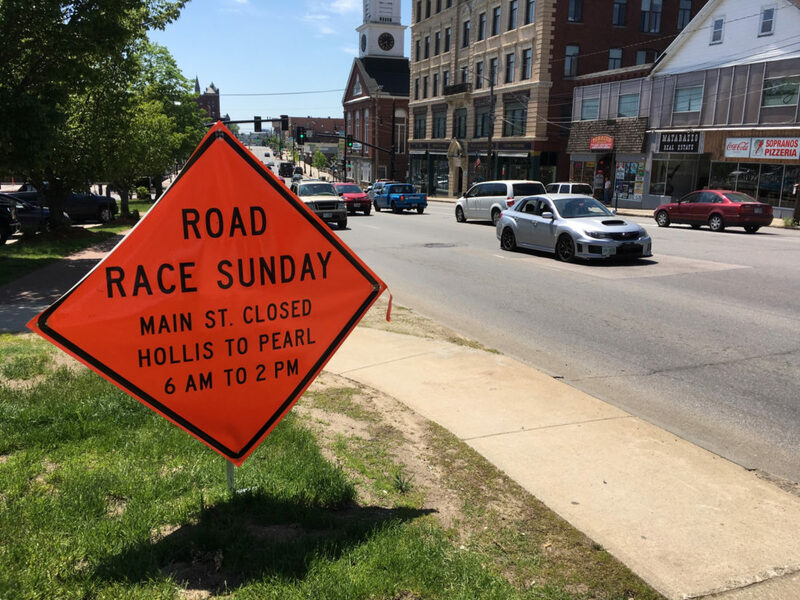 Main Street itself will be closed from Hollis to Pearl from 6 a.m. to 2 p.m. Many of the downtown merchants usually closed on Sundays will be open for the marathon. While the traffic closures will be inconvenient, Jordan said the race gets started at 7 a.m. on Sunday to lessen the impact. “Hopefully we’ll be done before people get out of bed,” she said. The race organizers are taking pains to make sure all of the runners stay safe through the event. There will be 19 police officers on duty at all of the lighted intersection on the marathon routes, she said.